Stephen Gale was the son of James and Hannah Gale. James was an agricultural labourer born in Horton and his wife Hannah was born in Tortworth. Stephen himself was born and brought up in Olveston. James and Hannah Gale had other children; Sarah, Ellen, Clara, Emily, and Mary. On 24th April 1873 Stephen Gale, a shoemaker, married Elizabeth Bartlett at St Phillips and St Jacob’s Church in Bristol. Elizabeth was the daughter of a mason, Nathaniel Bartlett, and his wife, Rhoda. She was baptised in Thornbury on 19th March 1848. They had at least eight children who were baptised in Thornbury; Frederick James Gale baptised 31st May 1874, Henry Stephen Gale baptised 17th October 1875, Willie Gale baptised 13th May 1877, Jane Elizabeth Gale baptised 1st June 1879, Robert Gale baptised 5th October 1881, Annie Emma baptised 5 August 1883, Alice Gale baptised 3rd October 1886 and Thomas Frederick Bartlett Gale born on 10th November 1889 and baptised on 2nd February 1890. At all the baptisms Stephen’s occupation was entered as a shoemaker. In the Rate Books of 1876, 1877 and 1878 Stephen Gale continued to be tenant of 44 Castle Street which he was now renting from J C Gwynn. By the 1880 and 1885 Rate Books J C Gwynn had died and Stephen Gale was renting 44 Castle Street from the trustees of late J C Gwynn. 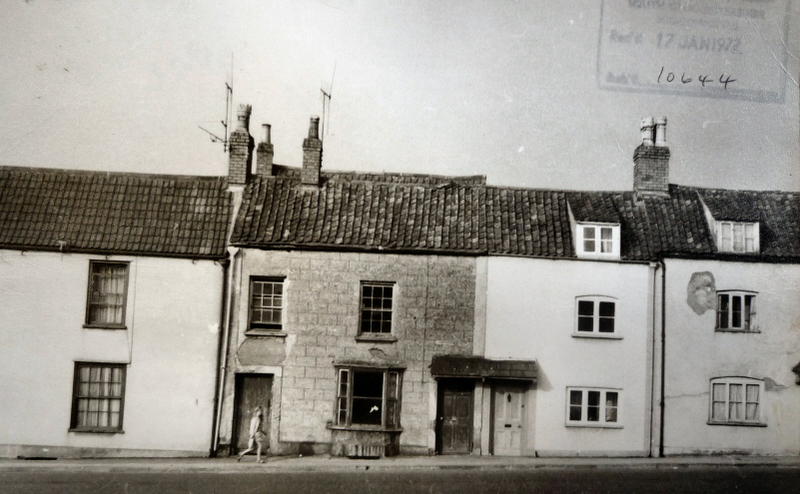 The 1881 Census shows that Stephen was a letter carrier as well as a shoemaker and says that he shared number 44 Castle Street with his wife Elizabeth who was 33 and born in Thornbury. Their children at that time were; Frederick aged seven, Henry aged five, Willie aged four and Jane aged two. Elizabeth’s parents, Nathaniel Bartlett a mason aged 61 and Rhoda, a shop keeper, aged 68 were in the household next door at 46 Castle Street. In 1896 Stephen Gale bought 40 Castle Street from William Powell for £140.00. At that time Alfred Brown was living in 40 Castle Street as a tenant of William Powell. The 1899 Rate Book confirms that Stephen Gale was now the owner of number 40 which he rented to William Gimblett. Stephen in turn was renting number 46 Castle Street from the trustees of late Miss Gwynn. In 1899 three dwelling houses and shop with gardens adjoining numbers 286 and 287 on the Tithe Map were put up for sale by auction. One of these (which we believe to be number 46) was in the occupation of Stephen Gale. The 1901 Census shows that Stephen Gale was living at 46 Castle Street and that he was 48 years old. His occupation was shown as both postman and bootmaker. His wife Elizabeth 53 was described as a grocer and shopkeeper. Henry aged 25 their son was a groom gardener, William aged 24 was a postman. The two younger children Alice aged 14 and Thomas aged 11 were still at school. The 1905 Rate Book shows that Stephen Gale owned number 40 Castle Street which was now said to be occupied by both Stephen Gale and Henry Stephen Gale. 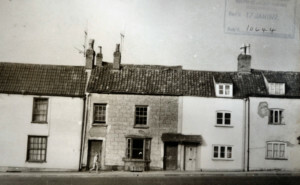 Mrs H H Lloyd owned number 46 Castle Street which was also occupied by Stephen Gale. We do not know in what sense Stephen “occupied” either house but number 46 was run as a shop for many years by Elizabeth Gale, Stephen’s wife. We believe that it was most likely that Stephen and Elizabeth actually lived at number 46 while their Harry son lived at number 40. The 1910 Special Drainage Book shows that Stephen Gale owned 40 Castle Street and his son Harry Stephen Gale lived in it. It also shows that Alice Lloyd owned number 46 which was occupied by Stephen Gale. Stephen Gale left number 40 Castle Street in equal shares to sons William and Thomas Bartlett Gale and daughter Annie Gale. Stephen Gale died 21st Jan 1914 aged 62 years. The newspaper report of Saturday February 7th described his funeral at Thornbury Cemetery. He passed away aged 62 having for some time suffered from heart disease. He was a member of the Ancient Order of Foresters and for the last five years of his life had been a Trustee of the Court. His coffin was carried by his friends and neighbours Gilbert Symes, William Penduck, Henry Longman and Joseph Davis. His sons H Gale R Gale and TB Gale were at the funeral and Misses A and B Gale, his daughters. Also at the funeral were his nephew Mr W Bartlett and his niece, Mrs W Poole. In 1921 Thomas Bartlett Gale then of 6 Ramsey Road Horfield, a clerk, Annie Short wife of Archie Short motor driver, Louie Eveline Gale of Castle Street widow and Elizabeth Maud Gale wife of Thomas Bartlett Gale, presumably acting as trustees of the will of Stephen Gale, sold 40 Castle Street to their brother Harry Stephen Gale of Castle Street, a postman. Elizabeth Gale, Stephen’s widow was listed under Castle Street in the electoral registers up to 1938 so we assume she carried on living at number 46 Castle Street. Elizabeth appears to have become the official tenant of the house and she had a shop there. We know this because this property was advertised for sale in the Western Daily Press of 2nd March 1935 as part of the estate of the late Mrs Lloyd. This house was said to be in the occupation of Mrs Gale. In the 1938 Electoral Register she is listed as being ‘c/o T. W. Nelmes, Morton’. Elizabeth died aged 93 and was buried in Thornbury Cemetery on 4th September 1941. The burial record shows she died in Castle Street. Frederick James Gale. Frederick James Gale was baptised 31st May 1874. He enlisted in the Royal Navy on 5th March 1892 for a period of 12 years. He had previously worked as a shoemaker. He was described as 5ft 3 inches, brown hair, blue eyes with fresh complexion and a scar on the right wrist. Frederick started as a ‘Boy 2nd Class’ and then worked himself up through ‘Boy 1st Class’ to become a Signalman and then Stoker. He was discharged from the Navy on 31st December 1903 as he was suffering from ‘Cerebral Disease’. During his time he served on several ships, including HMS Impregnable, HMS Vivid, HMS Blake, HMS Vivid ll, HMS Defiance, HMS Amphion and HMS Medea. In general Frederick was considered to be of very good character, although it was noted he spent 30 days in Bodmin Prison in 1894. In 1901 he was living in Devonport in Devon with his wife Agnes also aged 26. They had a daughter Alice aged two months. Robert Gale. Robert was baptised 5th October 1881. In 1901 Robert Gale was boarding in Malvern where he was a shoemaker. Jane Gale. Jane Elizabeth Gale was baptised 1st Jun 1879. On March 31st 1908 Jane, known as Jennie, the eldest daughter of Stephen and Elizabeth Gale died aged only 29 years and was buried in Thornbury Cemetery. The record of her burial shows that she was Jane Ochiltree. We have found that Theodore Nathaniel Ochiltree married Jane Elizabeth Gale in Bristol in the March quarter of 1906. Annie Gale. Annie Emma Gale was baptised 5 Aug 1883. She married Archie Percival Short on 25th October 1919 in Horfield in Bristol. William Gale. “Willie” Gale was baptised on 13th May 1877. William married Louie Eveline Adams, the daughter of Henry Barber Adams. William Gale left all his property to his wife Louie Eveline Gale, who thus became entitled to a share in the estate of William’s father Stephen Gale. The Gazette of June 23rd 1917 has a report of William Gale a postman and now a private in Essex Regiment who was reported missing but now known to be a prisoner of war. His wife and two little children in Castle Street had been notified. On July 7th 1917 William Gale was again reported as missing in the Gazette. It seems there had been some confusion about what had happened as William died 30th April 1917. William is listed on the War Memorial in Thornbury. On 2nd October 1921 Louis Eveline Gale, aged 33 and described as a widow whose address was Castle Street, married Herbert Goring, a railway porter. Thomas Bartlett Gale Thomas Frederick Bartlett Gale was born on 10th November 1889 and baptised on 2nd February 1890. Thomas attended the National School and then was admitted to Thornbury Grammar School in January 1903. He was obviously a very bright boy and had an Attwell’s Scholarship for three years. He left the Grammar School in December of 1905 to become a pupil teacher but returned in 1908 to complete his education with the help of a Gloucestershire Education Committee grant and to pass his Cambridge Senior exams. He left school in 1909 to return to teaching. He taught in Nailsea School and then on 1st September 1914 Thomas moved from St Nicholas and St Leonards School in Bristol back to the National School in Thornbury. Alice Gale. Alice Gale was baptised 3rd October 1886. On June 19th 1917 she married a butcher Thomas William Nelmes, the son of Edmund Nelmes a labourer. We have been told by local residents that Tom Nelmes lived in Castle Street in the 1950’s “with his sister.” There was a Thomas W Nelmes in Castle Street at this time ( in the Electoral Roll of 1950) but we can find no confirmation of where they lived. Thomas William Nelmes seems to have been born in Thornbury in 1891. The Electoral Rolls suggest that they lived in Morton after their marriage but by 1946 they had moved into Castle Street. Alice Nelmes died on June 19th 1948 aged 62. Thomas died in 1955. Henry Stephen Gale. The 1911 Census shows Henry and Sarah Gale lived at 40 Castle Street. Henry Stephen Gale was born on 19th June 1875. Henry was a postman. He married Sarah Scarsbrook of Daventry in Northamptonshire on 11th August 1902 in the parish church in Daventry. Sarah was born on 2nd July 1879 and was the daughter of Charles Scarsbrook a brewer. They had been married for eight years by the 1911 Census. At the time of the Census they had no children. Henry was a gardener. The Electoral Register of 1925 shows that Henry Stephen Gale and Sarah Gale lived in Castle Street. The Rate Book of 1926 shows that Henry Gale and his wife Sarah still lived at what later became number 40. The 1927, 1931, 1935, 1938, 1946 and 1950 Electoral Registers all confirm that Henry Stephen Gale and Sarah Gale lived in the same property. They later appeared with Jennie Margaret Gale, their daughter. Jennie was born in 1911. Elizabeth Sarah Gale (who appears to have been known as Sarah) died 3rd May 1952 aged 82. Her husband Henry Stephen Gale died in Thornbury Hospital on 20th August 1957 also aged 82. His address was still 40 Castle Street. The will of Henry Stephen Gale was dated 7th May 1953. Probate was granted 27th September 1957. Henry Stephen left his entire estate to his daughter Jennie who seems to have been an only child. See the photograph of the house in 1972. Numbers 40 and 42 Castle Street share a porch over their separate front doors. Jennie Gale. The Electoral Registers continued to show that Jennie Gale lived in the house. We have seen the obituary for Miss Jennie Gale who died in Thornbury in May 1996 in Thornbury Hospital, having lived all her life in her home in Castle Street. The obituary said that Jennie had once worked at Thornbury Hospital but that she left to care for her bed-ridden father. The register that was compiled in 1939 in the advent of war also shows that Jennie was living across the road at The Priory where she appeared to be a servant for Georgina Jenkinson. Miss Gale was a guide leader and very proud of her pack, some of whom kept in touch with her right up to the time of her death. We have an indication of the fact that Jenny Gale was involved in the guide movement most of her life. On the left we have a thumbnail image of a brownie pack which was probably taken in 1917 or thereabouts. We believe that Jennie was the little girl in white on the right of the very front row. Jennie sent this photograph to her friend Rhoda Ball nee Symes who is also in the photograph under the umbrella. She was also a regular contributor to Thornbury Horticultural Show and an enthusiastic member of the RSPB.